Sometimes, a German word captures the essence of what you want to express better than any English word. Auftragsklärung is one of those. 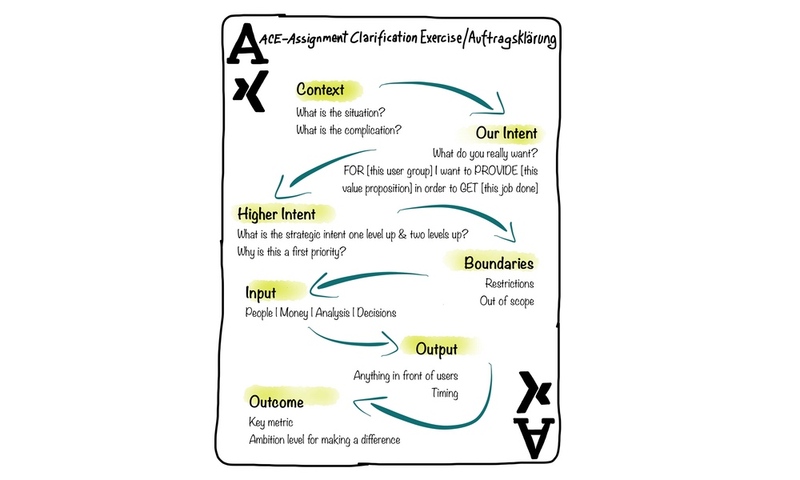 The best translation we came up with at XING is ACE: Assignment Clarification Exercise. 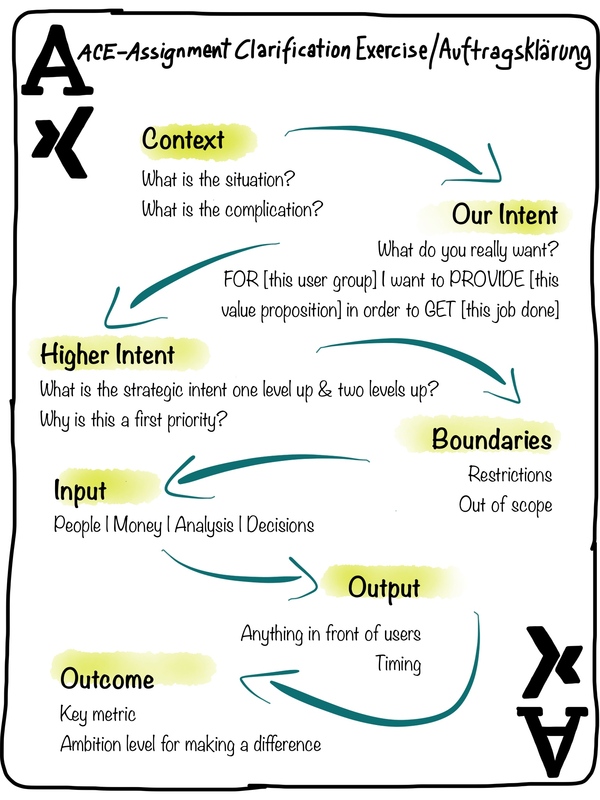 In autumn 2014, we at XING started to experiment with a new alignment format for larger new product initiatives. Thanks to Christian Becker, we got to know the work from Stephen Bungay, in particular his strategic brief. It is explained in his book ’The Art of Action’. We have since then incorporated elements from his strategic brief into our Auftragsklärung and iterated on the format. A new initiative doesn’t come out of the blue, but has its genesis. This is described in the first section context. Two questions are answered. First: What is the situation? This is a description of the starting point everybody agrees to. It is the common and shared understanding of facts. The second question to be answered is: What is the complication? There is always a trigger why you start something new. Something has changed. Examples are: you see a new market opportunity; some KPIs detoriate and you need to take action; you identified a new focus project in your strategy process; etc. Once the stage is set in this way, people are curious about the now what? This is answered by the next section. Given the context, the responsible product person now has to answer the core question: What is it that we want to achieve? It is about intent, not a concrete solution. This is an important difference that is often missed. The intent has to formulated in such a way that – as Stephen Bungay says – the Spice Girls’ questions is truly answered: What do you really, really want? It must be clear enough that the team knows where to look for a solution. And it must be general enough such that the team has room to come up with a HOW to fulfill the intent. FOR [this user group] I want to PROVIDE [this value proposition] in order to GET [this job done]. It also helps to further explain why you can actually provide this value proposition, ideally even better than the competition. This triggers a discussion about the assets you have for a good solution. If you want people to come up with helpful solutions to your problems, it is necessary that you give them sufficient context. This is especially important for the motivation of your intent, i.e. explaining the WHY of your intent. So in this section, you describe the intent of the people who are one and two level up. In many companies this comes down to the intent of your boss and your boss’ boss. But it is really more about the strategic intent one and two levels up. For example, the product owner of the XING contact section has to understand how his work contributes to XING’s intent for networking. And he has to know the role networking plays within the context of other XING services like business news or jobs. In addition, it is helpful to write down why people see the initiative at hand as a first priority to address their intent one and two levels up. The intent gives direction. It says where you want to go. It is positive. In addition, it is necessary to describe the negatives, i.e. everything that is outside the solution space. Naming those contraints actually gives you power as they contribute to defining the solution space. Anything that in not in scope should be stated explicitly. If there are things that must not happen, you have to write them down, too. Those contraints are a very valuable guidance for the team. Nota bene: Anything that is unclear or unknown (unresolved dependencies, market reaction) is not a boundary and must not be added in this section. Those first four segments are concerned with the problem space. The next three segments turn the attention to the solution space. This section should clarify all the resources and prerequisites that go into the initiative. This is above all people who are going to work on the initiative and the money you allocate. If there are others teams who must support this initiative, their committed support should be stated here. Any kind of internal documents, analysis, or decisions that you need before you can build something should be mentioned as well. Ideally with a deadline. Anything that shows up in front of users goes into this section. Examples are prototypes, MVPs, emails sent, marketing material used, etc. Ideally, the output is not formulated in features (like ‘search filters’), but in problems solved (like ‘ability to refine search results’ or even ‘getting more relevant search results’). Effectively the output section is a high level roadmap. Therefore, timings should be provided as well. The main function of the timing is to manage expectations of all involved stakeholders about aspired progress. Timing can change over time. What about other things we achieve (i.e. work results) that do not show up in front of users – for example user/market research or insights from data analysis? I advice people to be very strict with defining output as output in front of users. If something is not output in front of users, it should go into the input section. Otherwise, a lot of things creep into the output section just to make us feel good: see, we really got some work done. But what we need is results vis-a-vis the user. And even more important than output is the outcome we achieve. How do we know if the output we shipped is any good? How do we know if we made progress towards our intent? In order to answer those questions, you have to define a key metric by which you measure your progress. The metric has to be quantifiable. And you have to set a quantified goal for the key metric! The quantified key metric is only a proxy for our intent – it can never fully capture the intent as an intent is always more complex than just one key metric. But a quantified key metric helps tremendously. A stated ambition level for a key metric allows all stakeholders to judge whether they find it worthwhile to invest the stated input for the aspired result. Second, the ambition level also defines how a team thinks about the possible solutions. For example, reducing the loading time of a website from 5 to 4 seconds calls for different solutions than reducing the loading time to 0.5 seconds. Lastly, a quantified metric enables teams to measure progress and feel proud about their achievements. The Auftragsklärung is a tool that should be actively used to get everybody on the same page. The power lies in its ability to facilitate this process of creating a shared understanding and agreement. You know that the Auftragsklärung fulfilled its purpose once the stakeholders approve it and the team commits to it. Nothing has changed. We have to keep calm and continue our work. We encountered unexpected difficulties. Our intent is still valid, but we have to change our approach in order to handle the new insights. We encountered unexpected opportunities. Our intent is still valid, however we will change our approach in order to capitalize on the new opportunities. Our intent is not valid anymore. We have to fundamentally rethink our situation. Clear thinking and intent. Writing down your thoughts in full sentences forces you to think clearly. Very often one believes everything is clear. Yet when you start writing it down you realize that you are not as clear as you thought you are. And the ultimate test is whether other people also have the same understanding like you! It is important not only to write a Auftragsklärung but really talk about it with the stakeholders and the team. The owner of a Auftragsklärung has to make sure that it is truly understood and shared by everybody. Expectation management. Eckart von Hirschhausen once said: »Happiness is expectation management«. Getting everybody on the same page means that expectations are clear. It is important to surface all possible conflicts in expectations while creating the Auftragsklärung. The tool becomes powerful when everybody consciously agrees on it. It is only then that expectations are aligned. Creation of commitment. When an Auftragsklärung is truly understood and expectations are aligned, it creates commitment. And commitment will lead to the best outcome possible. Therefore, do not make any compromises with the Auftragsklärung. Only move forward once you have true approval and commitment. The Auftragsklärung has been especially designed to help in defining new product initiatives. It nicely seperates the problem space and solution space. It also utilizes other frameworks that are known in digital product management: job-to-be-done, roadmaps, output vs outcome. Therefore, product people can happily embrace it.